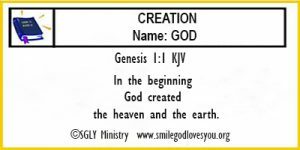 first created heaven and earth and then went on to create all things. He is the Creator and giver of life. He deserves our highest praise and thanks! Memorize this verse and share it with those you meet this week. Also, stop to give thanks and praise to the One True God, Creator of all things seen and unseen.